Portfolio watersoluble oil pastels are one of the inexpensive student brands that has a special place in any artist's sketchbook. The big giant wrapped round sticks are as soft as Sennelier artist grade oil pastels -- the only brand I've found with that level of softness. So when you're looking to emulate Sennelier effects and test things, reach for your Portfolios. They only come in 12 or 24 color sets but the 24 color set is usually under $10 online. I bought several 12 color sets as presents for my toddler granddaughter from a distance until I moved in and bought her another one. I discovered what kind of havoc I'd wreaked with soft, easily squished large sticks some of which were in staining colors when a baby and a two year old got hold of them. For wet effects, the color dissolves well and becomes opaque watercolor, very similar texture to a decent quality gouache. This is great for underpainting and they work well for swiping a wet brush over the stick to paint on the surface. 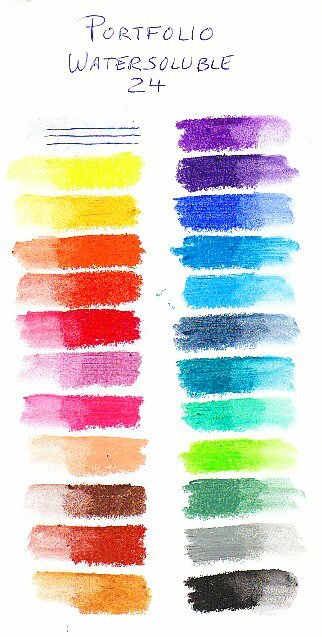 Easily soluble, the Portfolio watersoluble oil pastels have strong color and opacity when wet. The white isn't very opaque used dry but is a good lightener. Perfectly safe for the kids, these are nontoxic. They're not safe for babies' clothing, carpets, furniture or walls and moms may not appreciate your buying them for very small children. My granddaughter now only gets to use those under supervision while wearing scruffy clothes. She loved them because when dampened they were just as good for drawing on herself as on the paper. Not quite as strong as artist grade watersolubles for the purpose, but good enough that her clown makeup for Halloween was adorable. It's a little-known use for watersoluble oil pastels or artist crayons back in the 1990s when I used a set of 40 Neocolor II for face painting in the French Quarter along with numerous other street face painters. The stuff comes right off with soap and water but stains fabric, walls and carpets nastily in some colors. The box is sturdy, two sliding trays come out of cardboard sleeves with flaps that tuck in on both sides. Seven or eight techniques are illustrated on the package including sgraffito, so naturally I tried sgraffito on my example artwork to see how well the black covers light bright colors. It wasn't complete coverage but still very good. I could have gotten thicker coverage if I'd put the art in the freezer for twenty minutes, taken it out and given it an extra layer of black while it was cold. 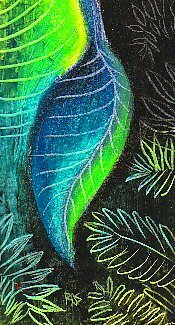 Temperature tricks help many oil pastels accept more layers. These are so soft that when the surface is thoroughly covered, the next stroke may just push the color around and mix it. They are so soft that they may wind up adding another layer when a painting done in firmer oil pastels will just push around and mix when shoved with its own sticks. So if you want to practice Sennelier techniques in your sketchbook for a low price, Portfolio watersoluble oil pastels are a good choice. The manufacturer is Crayola, something that took me a while to find out. They're handy for all sorts of things. Including Mardi Gras, of course.